I have had the most amazing time recently with my series Being Inbetween. This year it has been on exhibition at a lovely gallery in Hull, and most recently as part of the Saltaire Arts Trail in Gallery 2, Salts Mill, I have also received arts council funding, done a number of talks about the work, had articles in Huffington Post and Buzzfeed as well as a great review and a lot of national press interest. 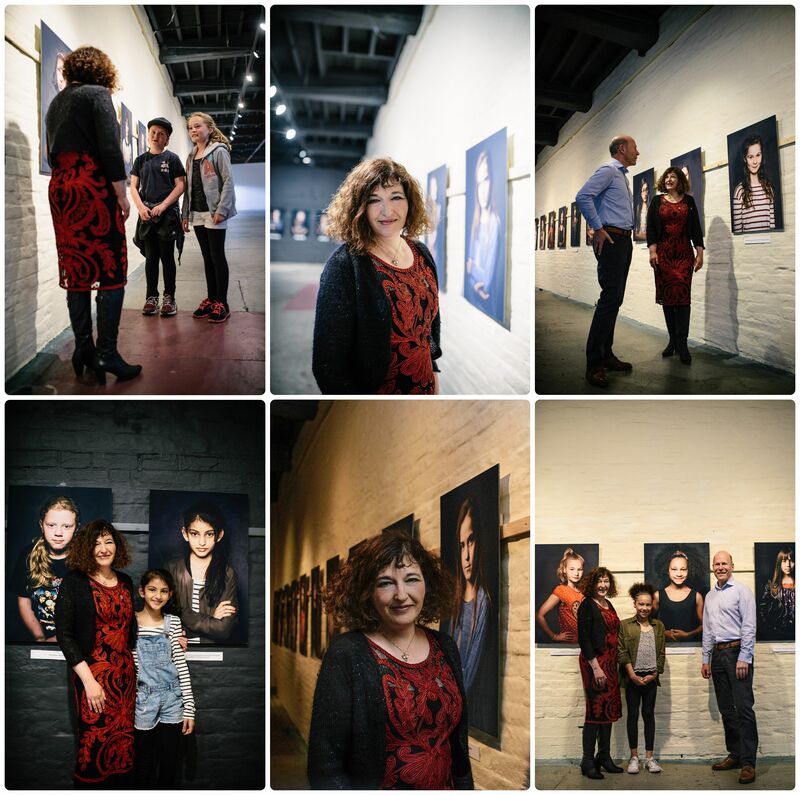 The exhibition currently comprises of 31 Portraits (large format mounted prints), with a soundscape of the girls voices mixed with ambient music. (Created with my interviews by Graham Coatman). The series is ongoing. 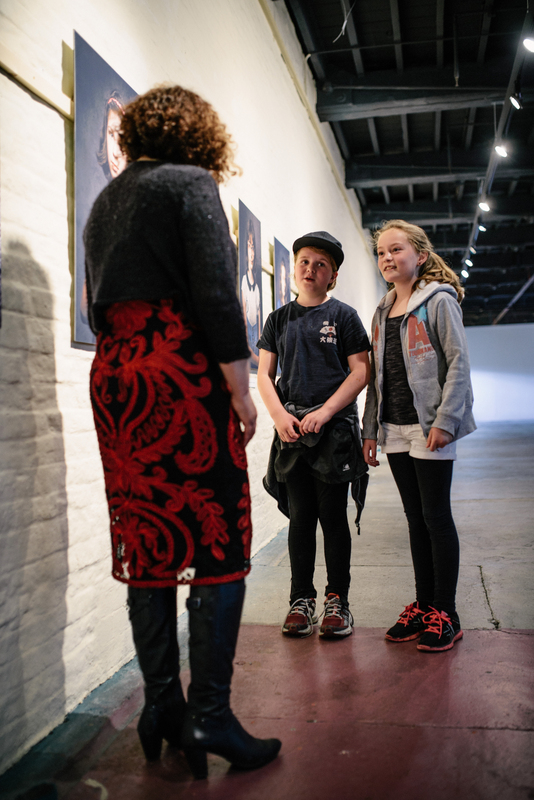 The picture above is of myself and two young visitors to the recent exhibition. Bea on the left and Pheobe on the right. They are both aged 10, the same age as some of the girls in “Being Inbetween” . They both had a lot of really interesting and surprising questions which I tried to respond to on the day. A few days ago I received an email from Phoebe and Bea with more questions. They had been really inspired and couldn’t stop discussing it, so decided the best thing to do was to send them all to me. I have decided to post their questions and my responses here. I am so impressed with their insight, and the way they have engaged with the work. I hope you will find this as interesting as I do. I am so so delighted that you have sent me these questions. It is fantastic for me that you are so interested in this work, and I hope that you will also be part of it too at some point. I will answer your questions one at a time. The project was from your personal experiences of being in between, as a girl. Do you think, having 2 sons, you could work with boys on the same basis? That is a really interesting question. I could work with boys, however this is a very personal piece of work, so it is as much about me as the subjects. I am exploring that age again, and allowing girls to do the same and I ask them questions and listen to what they have to say. Because this is a personal project it is very much from my own perspective too. Yes I could do a boys series, but that would be something else entirely. I do this work because I want to; because it fascinates me, and because I think girls of your age are seen as a group “tweens” rather than individuals. 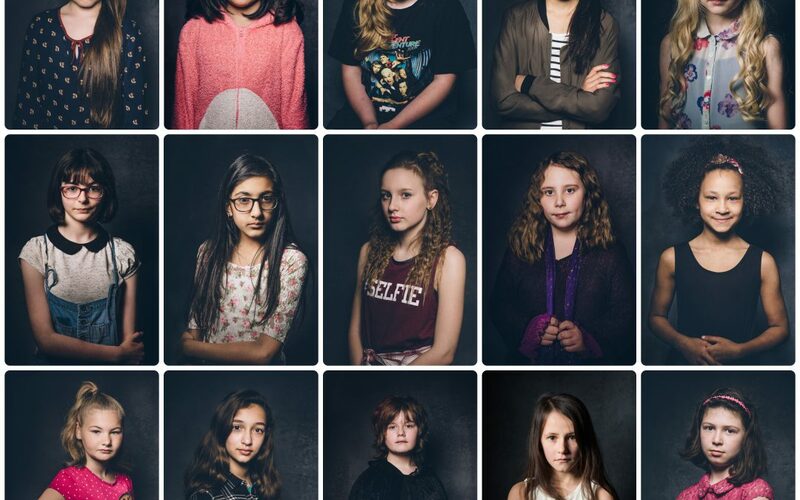 This is about ‘ordinary’ girls from different backgrounds, many who don’t have the opportunity to speak out aloud about themselves – and I want this work to give them a voice. Your daughter is old enough to take part in your project although she isn’t featured in the public series. Can you describe what part she has played in your work? My daughter is now old enough to take part, but doesn’t really want to at the moment, which is fine by me. All the girls in it choose to be part of it and want to be part of it. That is a very important part of the work. If a parent contacts me to say they want their daughter to be in it, I make sure that their daughter understands about the project, and wants to be part of it. If Poppy chooses later to be in it, than of course she can. My daughter has been in a lot of my photographs, but I make sure that she has some choice, particularly now adays. Because I have a girl I see how girls change at about 9/10 years of age. Many change from being free spirited to being more self-conscious and self aware. I noticed this before I had Poppy, with my friends daughters. I find it fascinating. Seeing the series on the internet made me wonder why you had chosen black for the background. When I saw the photographs in the gallery, that background made them seem so serious and gave them more importance. Is that why you chose black for the background? I wanted to make each portrait look like a traditional portrait in a gallery. Almost like an old fashioned portrait (oil painting). I achieved this by lighting it in a certain way, and by using my backdrop too. You are right, and it is a really great observation to say it gives “them more importance”. Each individual portrait looks Iconic and important, making each girl look important and larger than life – because I think they are! It encourages people to look at them. Have you noticed that each one looks you in the eye too? Another thing – by keeping the same background – it is less distracting and your focus is on the girl. We saw some of the girls from the project in the flesh at the exhibition. Some looked younger and less solemn than their photos. How did you make them appear older and more serious? I didn’t really make them appear older .I think that when people are standing still and looking straight towards you, they do tend to look older and more serious, and maybe a little bit more intense. Really I am wanting them to be neutral so we can really look at their faces and they are honest portraits. A lot of the girls look so much younger in real life (even I am surprised) because they are smaller than their portraits and also more animated and sometimes a little shy looking too. 6 How well do all the participants know each other? Most of the participants don’t know each other, and I only knew a couple of them a little before the shoot. I do feel like I know them now though. It is interesting that you and other people believe they may well know each other, and in some ways that is part of what I am trying to achieve by creating a “community” of girls. Would you consider doing a photo shoot with all the girls (so far) in one group, maybe in the Hirst Wood Bluebells? Why or why not? I wouldn’t do this because it would be a different piece of work. However I think it would be fun and a great idea. It would be hard to get them together as one group I think. Also they come from all over yorkshire and soon, further afield . They are all together as a group (in an interesting way) when I am exhibiting the work. Can you describe the subjects you would be most interested in working with next and in the future? This work (Being Inbetween) is ongoing, so I probably have another year to work on it. The next piece I am working on is called “First Generation” about people who were born in and live in the UK, but whose parents weren’t . Again like me my family did not come from the uk, and it makes me very sad to see how people treat others who are entering the country and who have to migrate or escape. The portraits will also be about the journeys people’s families have been on. The subjects will be selected because they have made a mark – or had a positive impact upon this country -maybe they are artists or politicians, or health workers or writers or voluntary workers. Are there any other experiences from your childhood that you would like to explore, photographically or in a different type of project? Great question – see the answer above. As an artist all my work is somehow related to how I have experienced the world, my own personal experiences and also my fascination for the stories that are rooted in peoples lives and communities. I love people and believe everyone has an interesting story to tell, particularly those who aren’t often listened too. 10. What has been the reaction, to this project, of the person who called your legs, “chubby”? Although it has inspired this amazing project many years later… this person must now be aware that it hurt your feelings and had a long-lasting impact on you. The person who said this to me, can’t really remember saying it. I think as parents we often say things that we probably shouldn’t to our children , and I am sure I have. Maybe I will have to wait to see whether one of my children creates an artwork or writes a book based upon something I did or said when they were little. If you have any comments you would like to make or any questions you would like to ask please do post them below. Finally I would like to thank Rachel Twigger who has been brilliant, as well as all at Salts Mill, and the Saltaire Arts Trail for supporting my exhibition, and wonderful FujiFilm who with CC Imaging have supported the fabrication of the exhibition by providing the amazing fineart paper and also put up with my constant demands , Stage 84 in idle, who have provided studio space for the shoots, and of course all the amazing girls I have met and worked with, and who are very much part of this ongoing series.